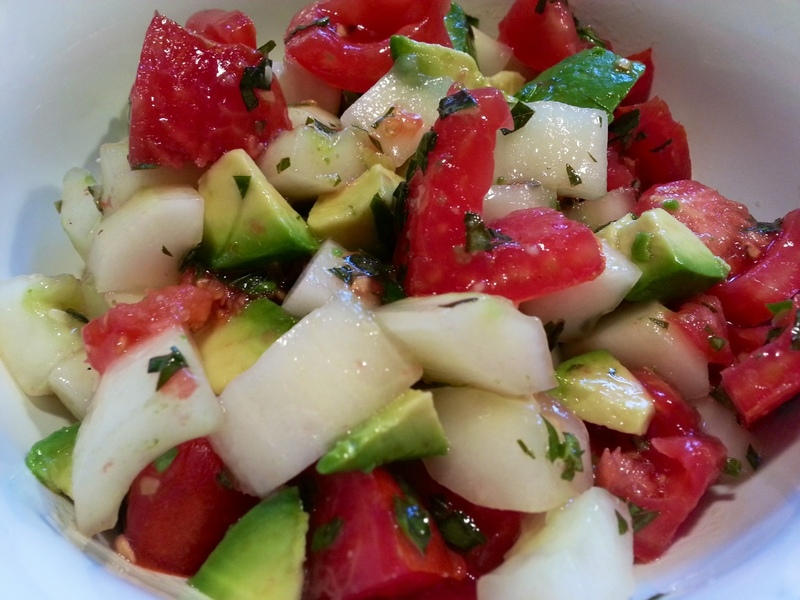 Chop ‘n Stir Avocado Salad | Mommy. Foodie. Athlete. When you have great ingredients, any salad instantly becomes better! Keeping with the theme of trying to keep up with my garden. This was a super easy and delicious side dish to our dinner tonight. Make sure to make the tomatoes and cucumbers in advance, but wait on the cucumbers so that they don’t turn brown. 1. At least one hour prior to serving, chop tomato and avocado. Mix in a medium bowl with the lemon juice, olive oil, and basil. Stir, cover and refrigerate. 2. When ready to serve, peel and chop avocado and mix in with salt and pepper to taste.